Earth's Internet & Natural Networking: Can Nature Predict and Forecast the Weather ? Can Nature Predict and Forecast the Weather ? Well not in so many words as much as actions. For Many people, September 1st marks the end of Summer. I know here in Sweden, it's almost like someone flips a switch and turn on the cooler temperatures, increases the wind and starts rapidly turning down the lights from that time forward. It also marks the beginning of American football (NFL) season which I actually watch late night sometimes on the international sports channel. Retailers have clearance sales on all their summer wear, as they begin to transition into fall and the winter season scene. For me, it brings a sort of sadness to my face knowing the days are getting radically shorter and the days are getting colder. 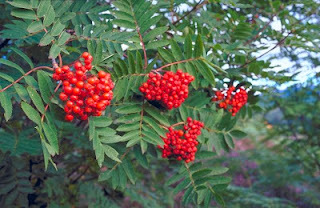 The end of summer, however, also marks the time when Nature begins to give off her signs of what our winter will be like. Although in Sweden, often times to the clues come very early. Yesterday, my wife and I went out for a walk in Trädgårdsföreningen (The Garden Society of Gothenburg) which is a Park in Central Gothenburg. I’m not overly sensitive to this swedish natural environment, but my wife often tells me of old Swedish sayings about plants which people for ages say predicts either a cold or mild winter. 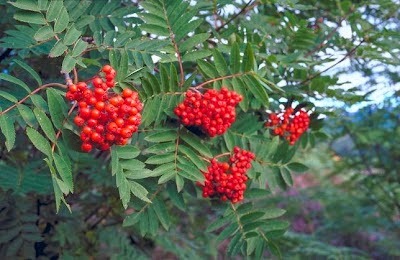 So any changes in the Boreal forest are familiar to a native Swede. Well, those at least still connected to the nature of things outside. Well yesterday, the amazing thing I noticed was the incredible amount of Acorns in the Northern European Oak trees as opposed to the lack of any acorns last season. Suddenly that "Hey wait a minute !" factor kicked in. That could typically mean a harsh nasty cold winter here in Scandinavia and that would agree with an earlier report this past summer my wife was reading about a much colder winter this year 2013/2014. Last Autumn & Winter (2012/2013) prior to my coming to California for the Spring visit, I deliberately went to Göteborg Botanical Gardens to look for Acorns to take to my mum's place to plant next Spring. There is an area where the acorns on the ground beneath four massive Oak trees are normally so thick, the ground looks like it has fresh layer of of road gravel laid down. 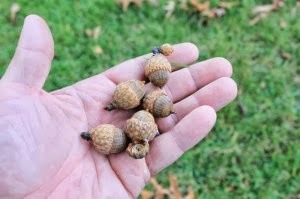 But all I found and collected was a mere handful of acorns. Probably 15 altogether and I had gone and combed the area thoroughly. All but five floated to the top of a bowl of water when I checked for viability. The others however never did germinate as I wanted. They were rotten inside. But it struck me as amazing, because our past winter was extremely mild, with little rain and almost no snowfall. What do the trees know ? Or rather what sensory mechanisms trigger such a response months in advance ? Earlier this year I remember watch CNN and a report they did on this coming Winter for the north hemisphere, but particularly North America. They mentioned that the Farmer's Almanac says so. Knowing the new Farmer’s Almanac was just released for the 2013-2014 year. Caleb Weatherbee is the official forecaster for the Farmers' Almanac. His name is actually a pseudonym that has been passed down through generations of Almanac prognosticators and has been used to conceal the true identity of the men and women behind their weather forecasts and predictions. I quickly looked up the southwestern United States and yep they predict a very cold winter with more wet than normal. Actually the new normal is drought, so going back to historical would be unusual. So this coming season is interesting. But not satisfied with that, I also checked another weather website location on the Net I had used in the past. I also cross referenced the Southern California area weather through this site, & Yes Sir, above average rain and cold. In fact they are predicting a little more than the Farmer's Almanac, but still pretty close. Man, we were going to visit in March. Below is their version of the map which also indicates a slight El Nino effect. Something about it being a moderate El Nino and allowing the southern Jet-Stream to pump in more moisture feeding into to those cold Pacific Northwest Storms which roll in off the Pacific Ocean from the north. So for Southern California, that means cold and extra wet. Our thinking here at Liveweatherblogs.com is a west based weak to moderate El Nino to develop in late fall or early winter. This will keep the southern jet active and allow for the areas from California to Texas to the Mid Atlantic to have above average winter precipitation. California will have above average rainfall and snowfall and even a few very big winter storms esp. along the coast. The Pacific Northwest will see near to slightly above average rainfall and snowfall." "The petals fold up when skies darken before storms or at twilight, not opening again until morning light triggers their rebloom -- hence its other common name, poor-man's weather glass. 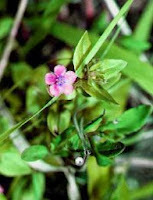 A native of Europe and Asia, it is sparingly naturalized in parts of the United States." Hmmmmm, I doubt that flower would do well as a predictor of rain here in Sweden. Maybe if there were one that could work the opposite way ? 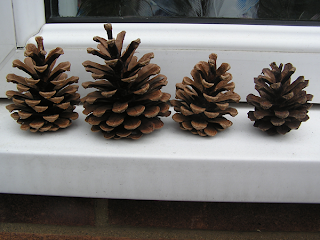 One other way I have heard of as being reliable in natural weather indicators are pine cones. This year here in Sweden has also shown an abundance of cones, at least in my area. But the Squirrels also have been going crazy all late summer chewing seeds from the still green cones and dropping them on my head as I walk to my Trolley stop. This also makes me wonder about the Parry Pinyon Cones which were not viable back in 2000 thru 2002 when I went collecting seed for Tree of Life Nursery. What a disappointment. But now I'm curious about the following winters and the lack of normal rainfall back then. Could something be learned there ? These cones have traditionally been used to forecast the weather as they change shape according to whether it is wet or dry. In dry weather, pine cones open out as the scales shrivel up and stand out stiffly. 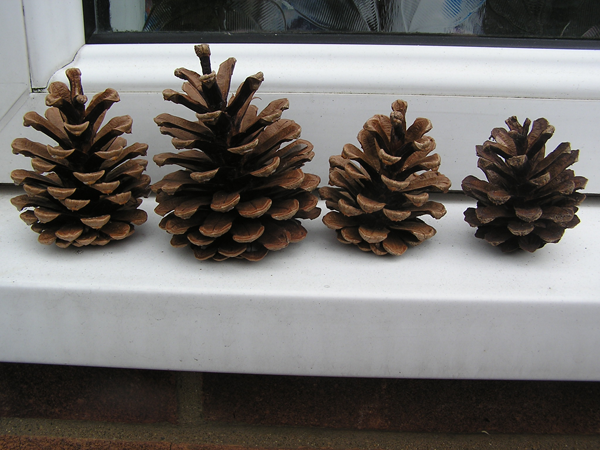 When it is damp, they absorb moisture and as the scales become flexible again, the cone returns to its normal shape. Although you can often see this even in sun and shade of opening and closing, but I think everyone has seen this, but never put two and two together before. Can Cows Really Predict the Weather ? The idea of watching animal behavior has in the past been one of the most well known natural weather indicators. The old wives’ tale that cows lie down when it is about to rain may not be so far fetched after all, according to a new study earlier this year from the University of Arizona. 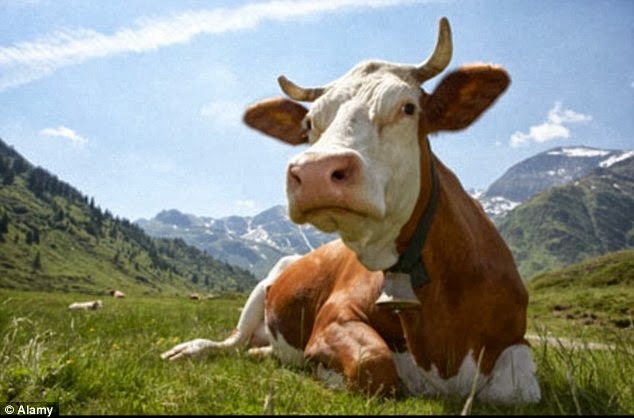 The researchers discovered that cows stand up for longer periods when it is hot, proving there is a definite link between their behaviour and the weather. 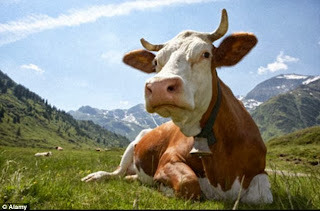 They also suggest that cows lie down when it is colder, which is often what happens to the weather just before it rains. This is explained by the fact that the cows sense the cooler temps and moisture in the air and are making sure they have somewhere dry to lie down. Next time you see cows out in a field, pay close attention to see if they are lying down or standing up. Then take note of the surrounding weather conditions or what soon transpires sometime after, just for fun. There is no doubt that the early American farmers (and I'm sure many others) held some strange beliefs if judge by today's intellectual standards. Many of these folklore or old wives tales as they are labeled have still survived until well into the 20th century, and some may still be around today. Those people lived closer to the land and observed natural phenomena of Nature and put things together. In other words, they used the Scientific Method before it was labeled such. Sometimes I even wonder if the Scientific Method is even used anymore from reading some of the literature that has come out lately loaded with what appears to be nothing more than storytelling. A columnist writer for Farm Collector, Sam Moore quoting from a 1926 monthly "Farm Life" magazine article referencing an old farmer who said, "A lot of folks don't believe in signs, but a heap o' times the frost nips them folkses' taters." This was funny, the old way of country speak was the way my Uncle Marshall back in Iowa use to talk. They were all intrigued by the Farmer's Almanac and planted by the dates suggested. They always did well. But Nature was not as dismantled then as it is now in our age of enlightenment. I wish I'd paid more attention and asked more questions of things back then. Now so much has been lost. I like research what many modern intellects dismiss as mere fables or myths, only to replace these with newer fables or myths and then fall back into denial. It hardly seems possible under the present system if Nature will ever heal back to what it once was or even better. Speaking of climate, the Climate of Human Leadership just question begs here. Clearly some sort of removal of their historical inept direction is in order soon, but in the mean time, we can all, especially Families, have fun in looking for ways to predict weather, that is if the change hasn't been made too drastic. Check out some of the fun references below. What do you use and trust as a reliable Weather Predictor ? Biological Power Plants & Electrical Mechanisms ?